Stephen Finnigan was worried that his lack of knowledge of science would put him in bad light when he set out to make a documentary on Stephen Hawking. Yet his weaknesses in the realm of science translate into strengths on screen. Hawking, co-written by the world’s most famous cosmologist himself, takes a personal look at its 71-year-old subject, with an emphasis on family over physics. After seven months of intimate filming, often without a cumbersome crew, Finnigan found Hawking to be a determined and often funny man of enduring brilliance. Cameras fastened to his wheelchair grant a sense of the world from his perspective. 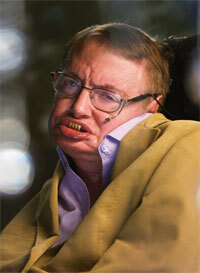 Paralysed with Motor Neurone disease, Hawking has defied death far longer than anyone had predicted. Old photographs of his undergraduate years and stories of his quirky upbringing lend poignancy to his physical deterioration. Hawking’s contributions to the film, released in September, ensure there are no contentious exposés (nor any mention of his controversial second marriage to his former nurse). Yet some shrewdly probing interviews examine the breakdown of his first marriage.